In support of a strategy to transform care, the team designing Howland Medical Center had a key goal: deliver an outstanding patient experience. 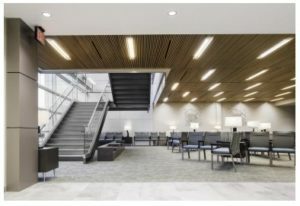 $15 million of strategic capital was used to fund the development of this 46,000-square-foot, two-story ambulatory facility, created to deliver quality care that connects patients with both physician practice and hospital programs within a single campus. The facility became operational to the public in the fall of 2017. Strollo Architects worked closely with the Mercy Health team to re-imagine a facility for an enhanced patient experience. When designing Howland Medical Center, areas were planned to accommodate patient traffic patterns, optimal privacy and new technology to improve flow. 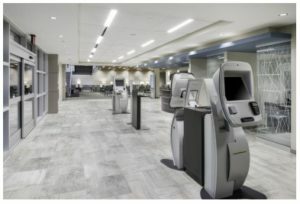 The team chose an approach of concierge-style staffing – rather than a traditional front desk model—allowing staff to be immersed in the lobby space to greet and guide patients through check in. In the space, digital kiosk and pager technology was implemented to streamline the circulation of patients. Thoughtful natural elements make the expansive waiting area an inviting space, including glass walls that allow for an abundance of natural light, and warm wood slate ceilings. Small groups of strategically placed seating provide a sense of privacy for patients and their families. A soothing and nature-inspired aesthetic is carried throughout the hospital, into CT and MRI rooms with backlit ceiling murals, into spacious exam rooms where patients can be comfortable in large multifunction exam chairs, and enjoy natural light through high windows. Within the first floor of the facility, rehabilitation medicine, imaging and a lab have been incorporated within short distance to physician practice areas that are organized in a series of pods. A second phase of development involves the placement of primary care physicians to the second floor of Howland Medical Center, thus creating a full-service facility that combines physician care with hospital services. Weaving in the concept of a patient-centric approach, this aspect of the facility will utilize continued digital technology, and operate on a unique physician time-share model. Jack Gibson Construction Company served as general contractor on the project. The biggest challenge was a very compressed construction schedule due to adverse weather conditions. At the very beginning, bad weather held up the foundation and site work, but the team had a fixed finish date they had to work within.